The Index though opened weak but saw a steady rise towards the highs of the day at 8428, a sell-off though saw the index close in red at 8365.65, small loss of 8.00 points. The broader market was positive, with 781 advances to 711 declines. Developing Range as per Option Table comes to 8000-8600. Call option 8400-8600 added huge 13.97 lacs OI with profit booking seen at 8800 strike price. Put option 8400-8300, 8000 added huge 16.78 lacs OI with profit booking seen at 7900 and below strike prices. Nifty Open Interest is at 1,36,03,075 down by 21,050, with decrease in price, most probably long liquidation. 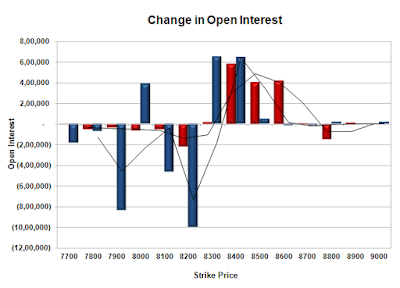 Bank Nifty Open Interest is at 16,75,475 down by 84,850, with decrease in price, most probably huge long liquidation. FII’s bought huge 6.73 lacs Futures, which includes 20951 contracts long build-up and 5981 contracts short covering, with increase in net OI by 14970 contracts (includes 75663 longs to 48731 shorts for the day) and the Average Price comes to 8923.13. FII’s Index future open contract as on date is 241370 Longs to 271433 Shorts, Net Short 30063 contracts. Initial support at 8300, with OI of 49.26 lacs and below that at 8200 with OI of 42.42 lacs. 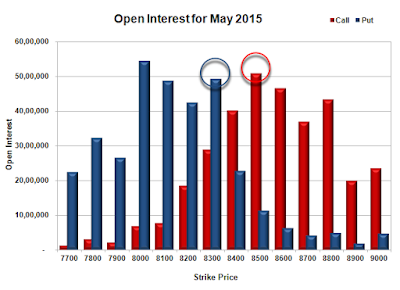 Initial resistance still at 8400, with OI of 40.17 lacs and above that at 8500 with OI of 50.97 lacs. 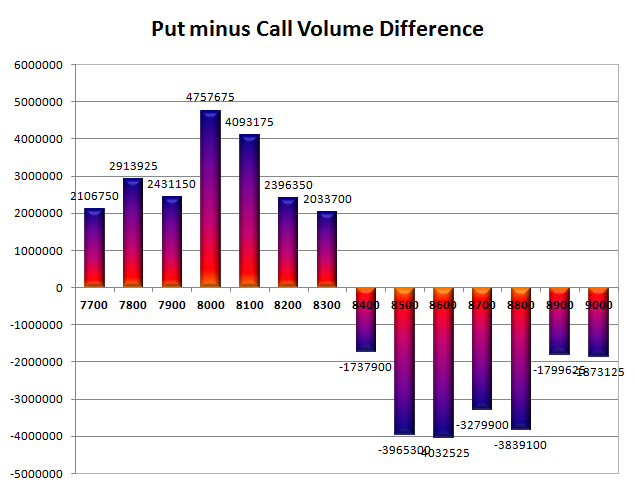 Day Range as per Option Table is 8282 - 8465 and as per VIX is 8286 - 8446 with 8376 as the Pivot.